When I was asked by Zero Calorie Advent Calendar to get involved with them and send in a recipe, I jumped at the chance. All I was told was that it needed to be seasonal and healthy. 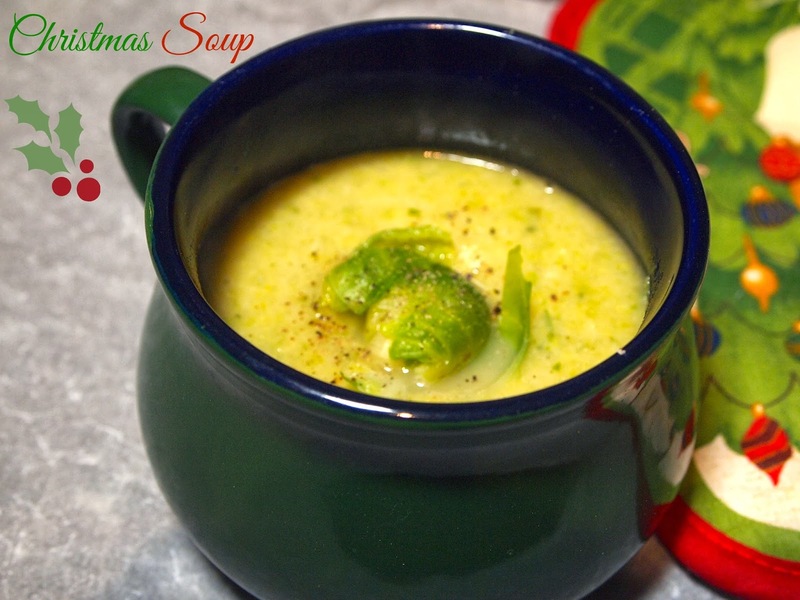 My immediate thoughts for Christmas recipes don't tend towards the healthy but if I start to think of some of the healthier options available, it wasn't hard to come up with this Christmas soup. I'm a massive lover of sprouts and chestnut. The lemon juice takes off the bitterness that sprouts can have and the sage is quite a subtle flavour to add more seasonal interest to the dish. What's also good about this soup (and vegetable soups in general) is that you can make a batch of this on Sunday and it's fine until Wednesday, meaning that half the week at work is all done - no thinking about what you have to make, no temptations to go and try out the seasonal food/coffees in the local coffee shop. I also find that I avoid that afternoon slump when I have a good bowl of soup for lunch. It's also not too bad on the pocket either, coming in at about 50p a portion. If you're looking for other soup recipes, I have 21 of them here. It's not the best looker in the world but it does speak of Christmas to me - not least because I usually end up eating ALL the sprouts that I cook at Christmas. Stats: - 4 servings, 1 propoints per serving, 0.7g fat - 0.2g of which is saturated fat, 76 kcal per serving. Melt the butter in a large pan. Sweat the onion for around seven minutes over a medium heat until they begin to go translucent. Add the brussel sprouts and vegetable stock. Bring to the boil and then simmer for 4 minutes. Add the chestnuts and simmer for a further four minutes. At this point, the sprouts and chestnuts should be cooked through. Add the lemon juice and sage. Cook for a further minute to allow the sage to infuse. Remove from the heat. If you want a garnish, remove a few of the sprout pieces from the pan. Blend until smooth. Top with the sprout pieces if wanted. This post marks 100 posts up on KneadWhine since I started it back in 2010. Back then, it was pretty sparsely populated with pretty poor photos and not a lot of time and attention. Now I'm managing about three posts a week most weeks (mostly through the miracle of pre-scheduling weeks in advance) and I've met all kinds of interesting foodie people on Twitter and found far more blogs to read than I have time to. I've also found loads and loads of new ideas to make the next 100 posts even more interesting. Thanks for reading!